Building on an Inner-City Narrow Block? Given the rapid growth of Australia’s major cities, few of us are thinking much about quarter acre blocks. For the many of us that work in the city, or want to be close to the action: cafes, restaurants and bars, building your new home in an inner-city, narrow block is an ideal choice. A lot can be achieved on a narrow block, providing you work with an experienced builder – and do your homework! Don’t be put off by some of the very narrow, old-fashioned terraces. They were built at a time before we knew better. Today, we can fit a lot more into the same amount of space, making life in a narrow block home extremely enjoyable. Here are a few things to keep in mind. How important is it for you that you still own a car? For many of us, it’s still imperative. And if you’re planning on living close to the city, let’s face it, parking could be hell! In fact, those living on a small block without a car bay often look at a garage with the kind of envy you never would have dreamt of a generation ago. So if you can’t see yourself coping without a place to easily and safely park your car, make sure you include a garage. You could go single bay, a narrow double, aka a priority parking garage where the most used car is at the front, or double garage. A double garage will minimise the amount of street frontage, but it also could be a wonderful asset. Remember, garages can also be used for a host of other things over time. If you want more than three bedrooms, we recommend you go up a floor and choose a double-storey narrow lot home. Keep in mind, it’s still possible to have generous-sized bedrooms, even with ensuites. It’s all about clever design – and priorities. An abundance of rooms in a narrow lot home will make your house seem pokey, dark and uninviting. Keep things inclusive and open-plan. This will be far more enjoyable to live in, feel more spacious and you can enjoy a lot more natural light and fresh air-flow throughout your new home. 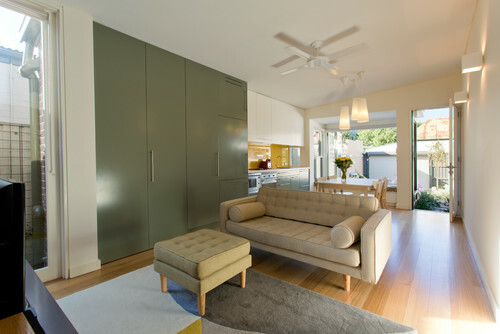 Now a much loved Australian staple, alfresco areas are a fantastic inclusion in your narrow block, inner-city home. 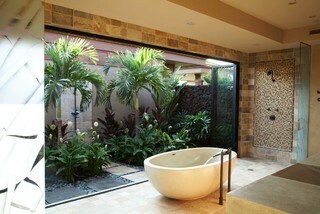 It allows you to have a wonderful connection to the outdoors, albeit with little space. With clever design, you can create a treasured haven in your home for sitting and reading quietly, eating, entertaining and simply enjoying the fresh air. 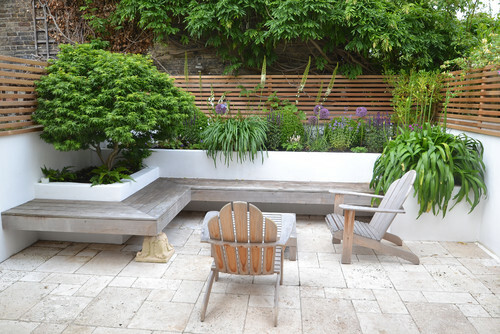 Similar to alfresco areas, small, surprise garden areas can be added to your urban infill home with striking effect. Think of a small side laneway area where a vertical garden can be grown, an indoor garden or perhaps even a small patch of garden in an indoor-outdoor bathroom area, providing the bathroom is at the side of the house. Think ahead, and get creative. Ensure that your house has loads of natural light which has an unbeatable ability to put you in a positive mood and create a sense of space. In particular, make sure the northern aspect of your home has ample windows. If you’re concerned about privacy, think about one-way glass or some of the wonderful screening options available. If security is a concern, take a look at some of the more attractive security bars or classic wrought iron options. Skylights have come a long way, so if you still think of them as a crude square box on the roof, think again. 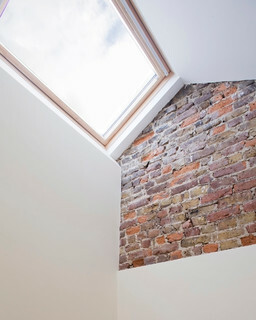 A good skylight can be transform the look and feel of your home. You can run long, thin strips of skylight, have a series of skylights across a room or even a glass roof to invite loads of warm, wonderful sunshine into your home. A ceiling height of 2.7 m above will immediately make even the smallest room look larger due to all that vertical space. It’s also a great way of keeping a room cooler. What about a void in your living room or kitchen for a fantastically dramatic effect that will also give the room a light and airy feel? Don’t let any space go underutilised! Space under stairways can be turned into miniature studies or cupboards. Likewise, any cavities can be made into storage space. Standard items like beds can have built-in cupboards. Sometimes, hallways are inevitable in a narrow home, so where possible, think of installing large windows or glass panels to allow light in. For more inspiration, see our narrow lot home designs, such as the California, Malibu – Rammed Earth design and the Grand Island home design.